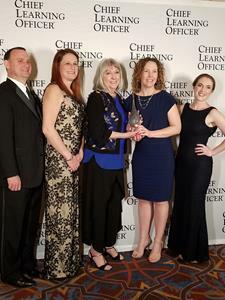 HERNDON, Va., April 04, 2019 (GLOBE NEWSWIRE) -- ManTech (Nasdaq: MANT) today announced that the company has won its second LearningElite Gold Award from Chief Learning Officer Magazine, sponsor of the honor bestowed annually to organizations for the best learning and development programs. Accepting the award for ManTech: Damian DiPippa - SVP & GM, Mission & Intelligence Solutions; Yvonne Vervaet - SVP, Growth & Capabilities; Karen Gardner - Chief Learning Officer; Stephanie Flory - Workforce Planning & Technical Training Manager, and Maggie Sams - Principal Technical Writer. "The organizations ranked at the top of the 2019 LearningElite are not only recognized for achieving outstanding outcomes for their own enterprises, but they also provide a significant yardstick against which other companies can assess their own progress toward turning learning and development into a measurable driver of business results," said Sarah Kimmel, director of research and advisory services for Human Capital Media, which publishes Chief Learning Officer. ManTech provides mission-focused technology solutions and services for U.S. defense, intelligence community and federal civilian agencies. In business more than 50 years, we excel in full-spectrum cyber, data collection & analytics, enterprise IT, systems and software engineering solutions that support national and homeland security. Additional information on ManTech can be found at www.mantech.com.